Children are much less likely to overindulge if they already feel full, plus eating the meal stimulates essential saliva that will help lessen the effects of the sweets they do eat. Chocolate is a better treat than sweets as it melts quickly and doesn’t generally stick to teeth and washes away easily. 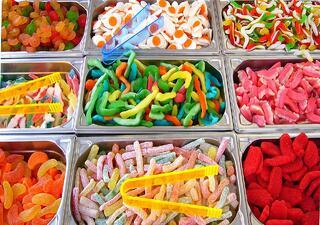 Choose sweets that can be eaten quickly and easily to limit the amount of time sugar is in contact with the teeth. Limit consumption of sour sweets that may contain acids (such as citric acid) to intensify the sour flavour. These acids can contribute to dental erosionand cavities. Make sure your children brush and floss their teeth before going to bed. In the end, it's the basics -- brushing twice a day, flossing daily, and getting regular dental checkups-- that have the most impact on a kid's smile. 20/20 Dental Practice in Newbury offer NHS dental treatment for children.